Many people see this type of arrangement as very cold. However, you see from the picture that this is actually a misconception. 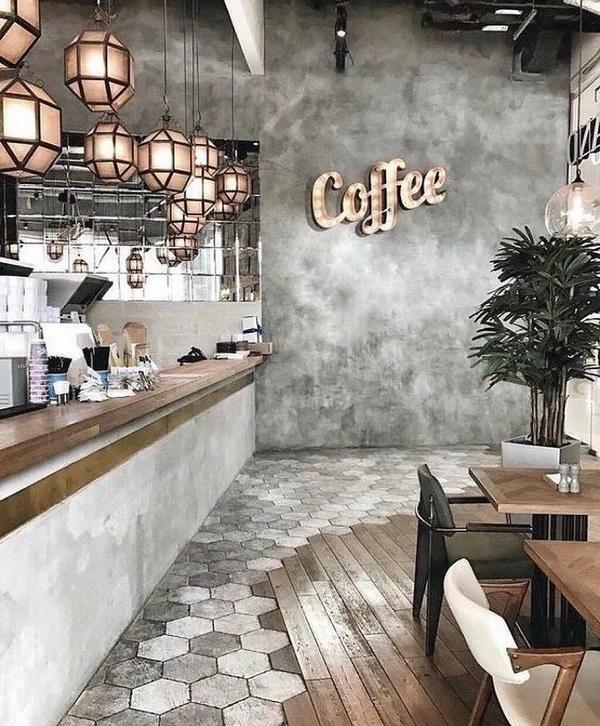 Somewhere between the warm rustics and somewhat cool Scandinavian design of interior decoration, an Industrial style has emerged, as a kind of combination of these two styles. This style is inspired by industrialization that happened at the end of the nineteenth century and at the beginning of the twentieth century. 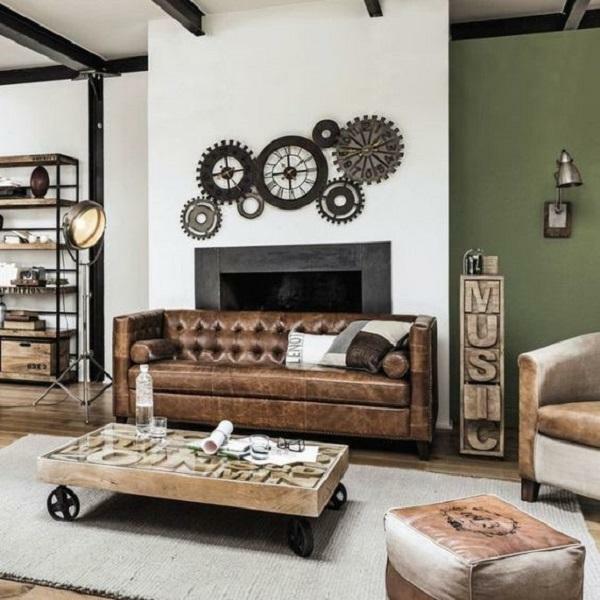 Industrial style may not necessarily be cold, on the contrary, like all other styles can serve as a guideline in creating very warm home. This style can be found in some modest attics as well as in a richly decorated large luxury houses. This is an increasingly popular type of arrangement for which younger people decide. 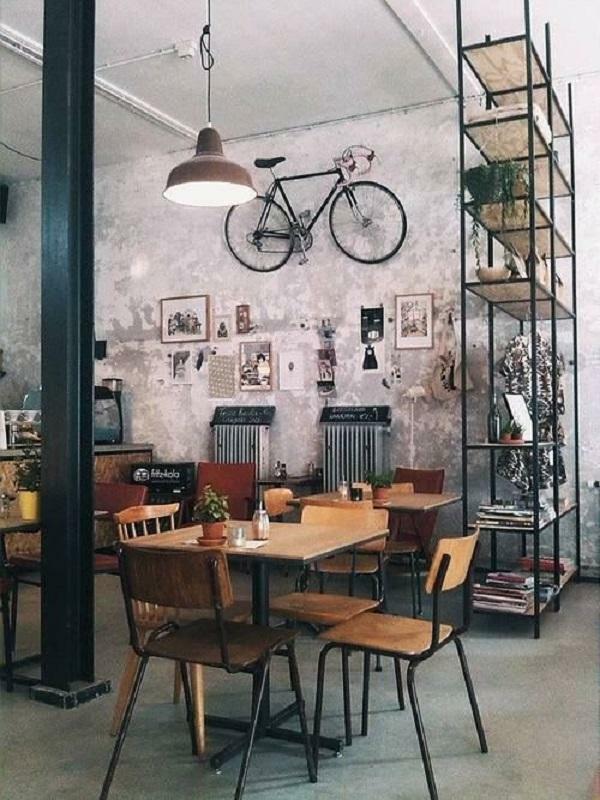 People who make decision for this extravagant type of arrangement are those people who don’t want modern minimalism in their space, and who want something new and who are brave to turn their desire into real life. Except in the interior design, this style can also be applied in the exterior arrangement. For example, large cables and bulbs can be used to get the desired effect. 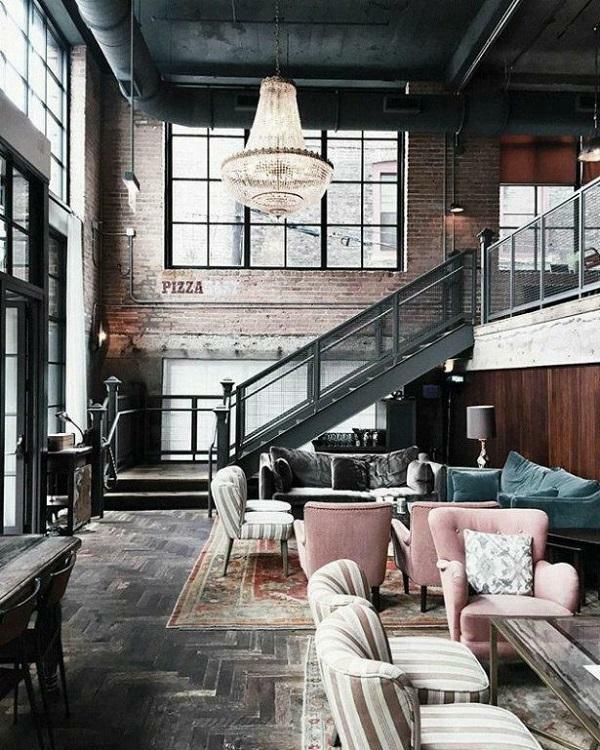 The world has recently become obsessed with renovating old warehouses, stables, old industrial buildings and creating a very pleasant ambience of these ruins. 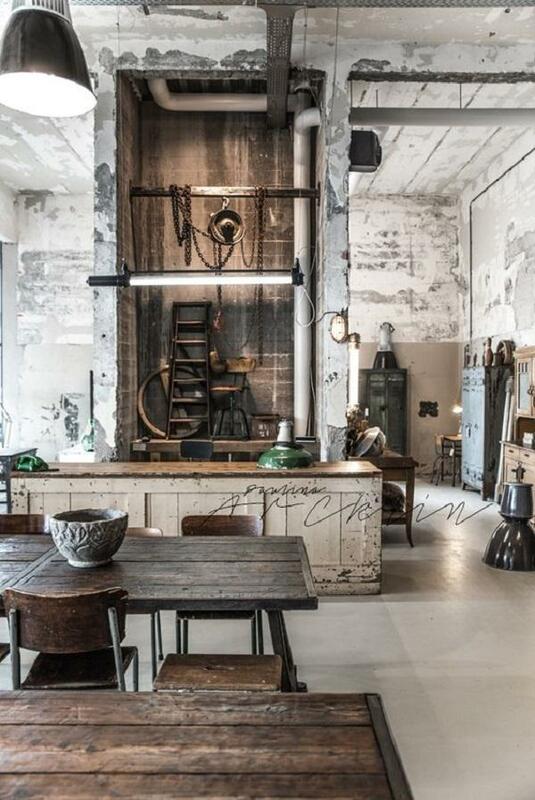 The industrial style is perfectly imperfect. Walls of brick, steel beams and rods, concrete, bare installations, untreated wood are the basic characteristics of this style. This probably sounds very cold, but if you add vases and flower pans to it, leather furniture or furniture from a fabric material, shelves for books and decorations, curtains and similar details, you will get a very warm corner for you and your loved ones. And very modern, of course. 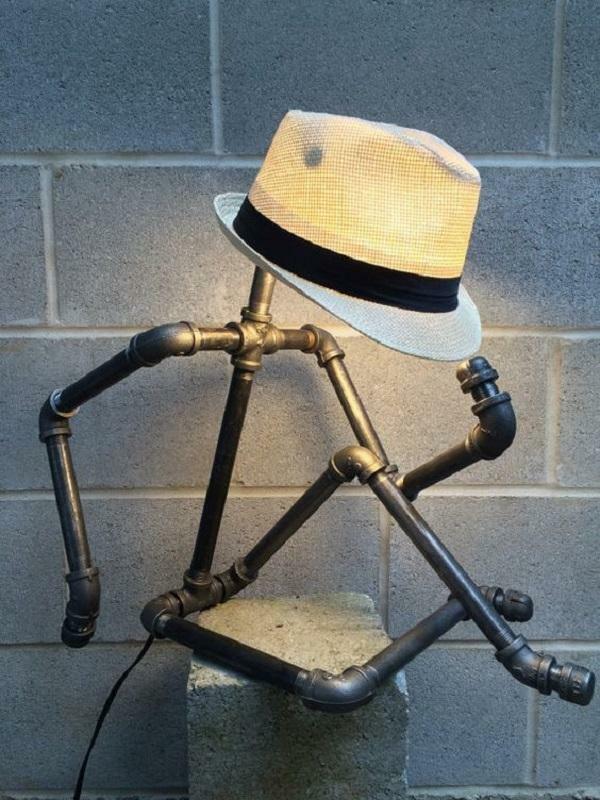 Metals such as nickel, copper, iron are unavoidable in the arrangement of this style. Namely, at the time of steel and iron production in all parts of the world, iron has been widely used, both for the production of locks, as well as for water and sewage networks, stairs, roof and supporting elements. Today, in homes around the world is used wrought iron. If you are arranging your home in this style, you must inevitably have some kind of artwork on the wall, or totally the opposite some plain poster, and even a wall you can print or draw some symbol on it. Take advantage of the mural but do not forget the fireplace in the living room. All this will bring you and your guests back into history. 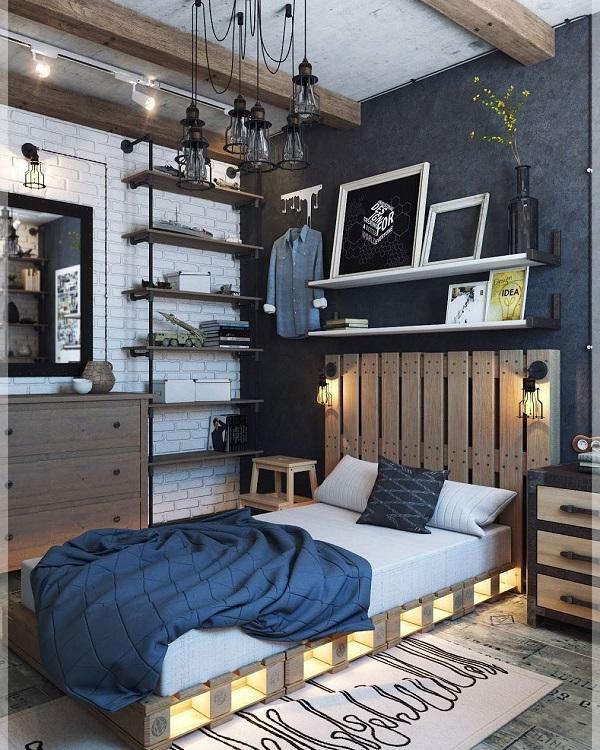 Make your bedroom minimalist decorated with only a few details. The bed can be large and comfortable regardless of whether it is made of formal or informal iron. The cupboard can be metal like those used in the dressing room. 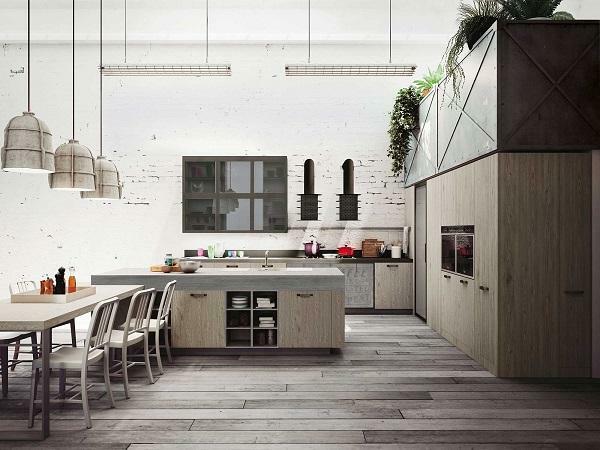 Thanks to the modern kitchen elements of stainless steel, the kitchen will be easiest to arrange. Choose tiles in your bathroom or kitchen in one color and the fug mass in the opposite color. 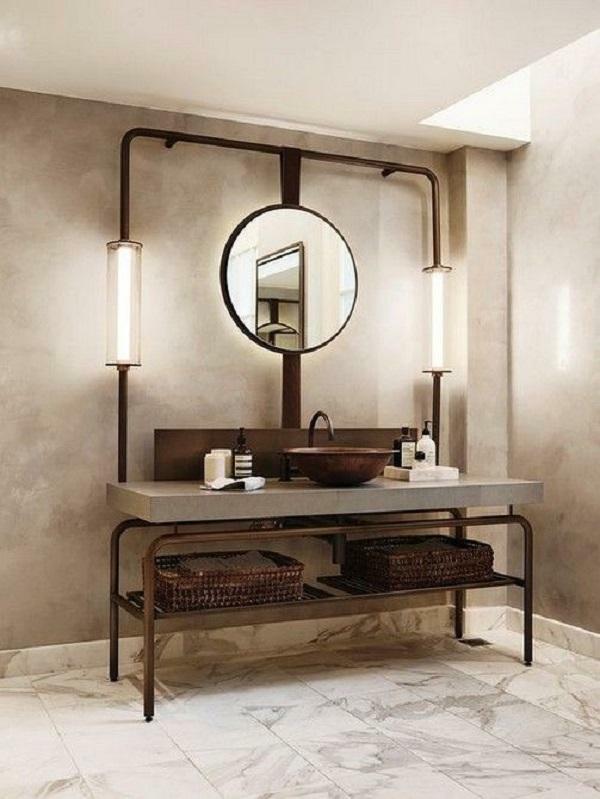 Do not exaggerate with metallic details, but cleverly use a few that will give your space a glamour note. Enjoy the gallery, you may find some old, but very modern detail that you will love for your home. 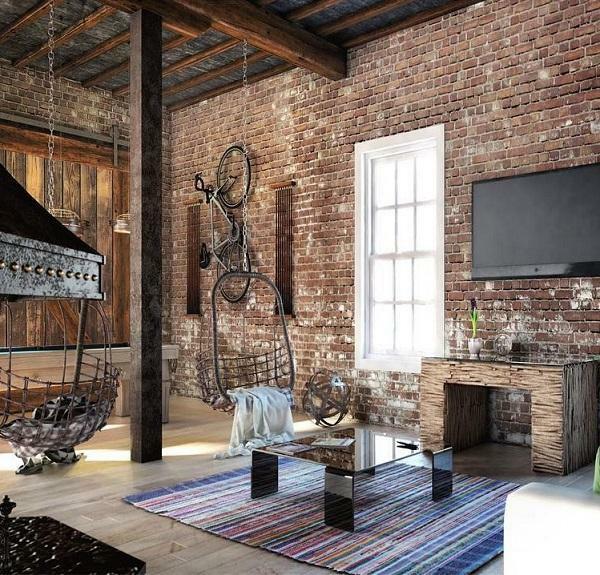 Converting abandoned old buildings with high walls, converting stables and warehouses, old factories into residential areas has become a very popular trend around the world. One of trademarks of industrialism is iron and steel. 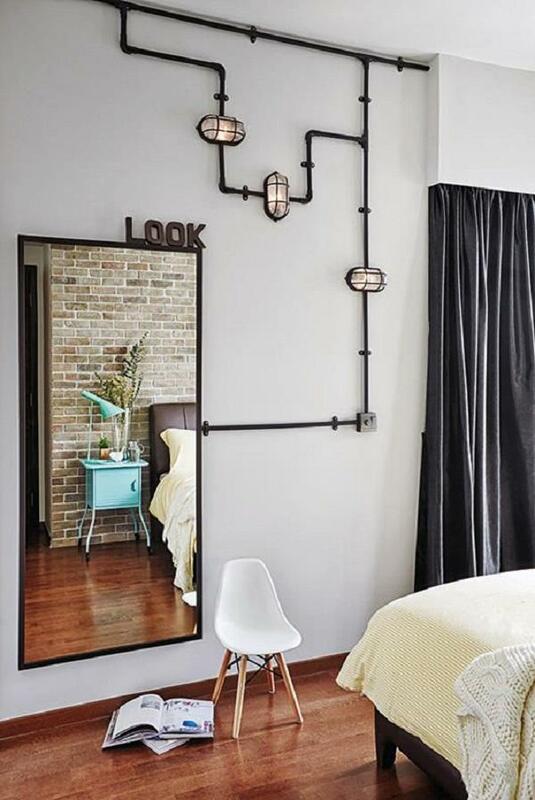 Iron is widely used and here you can see how to give your home with the help of iron pipes a note of extravagance. This style is easiest to apply in the kitchen thanks to modern stainless steel used for production of kitchen appliances. 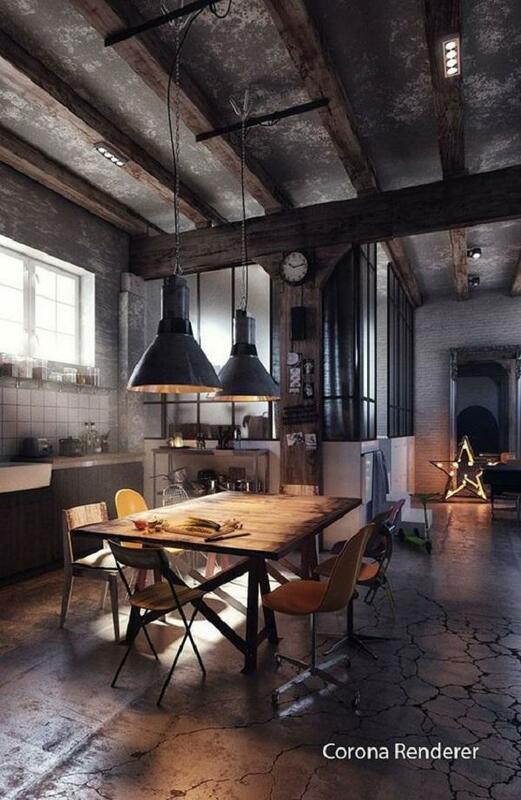 Large bulbs and metal pieces of furniture can be found in this very brave way of arranging apartments and houses. 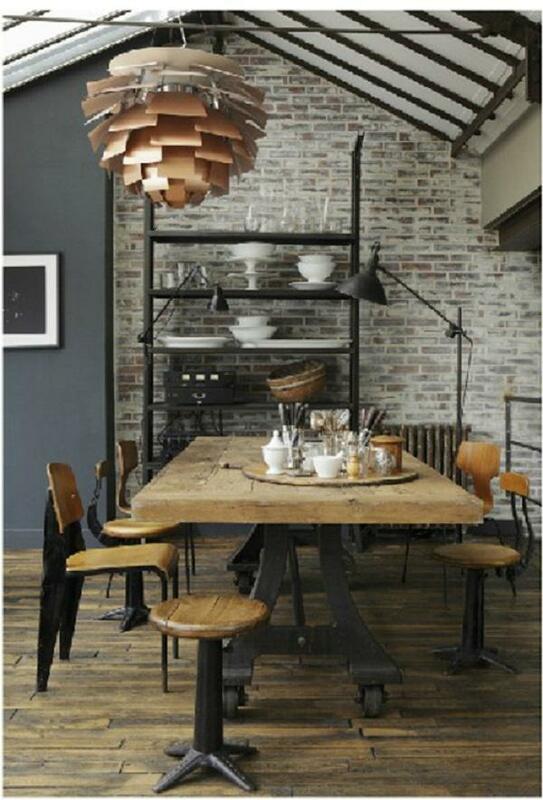 This style reminds a lot on the Scandinavian style of interior design. 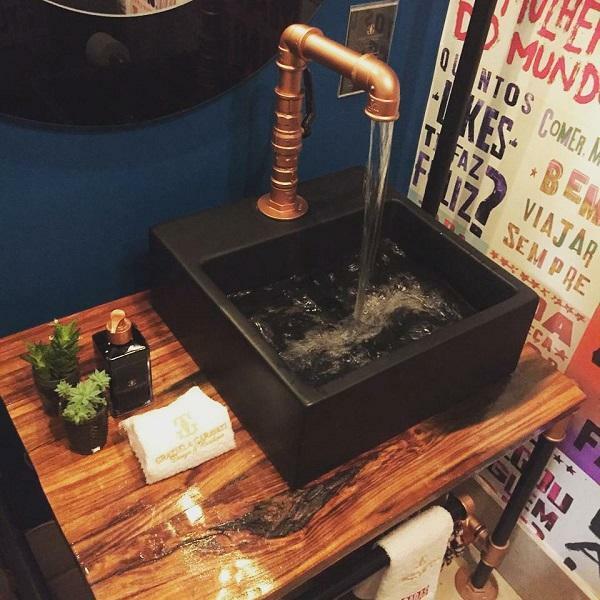 In both styles is used wood, iron, leather and other natural materials. 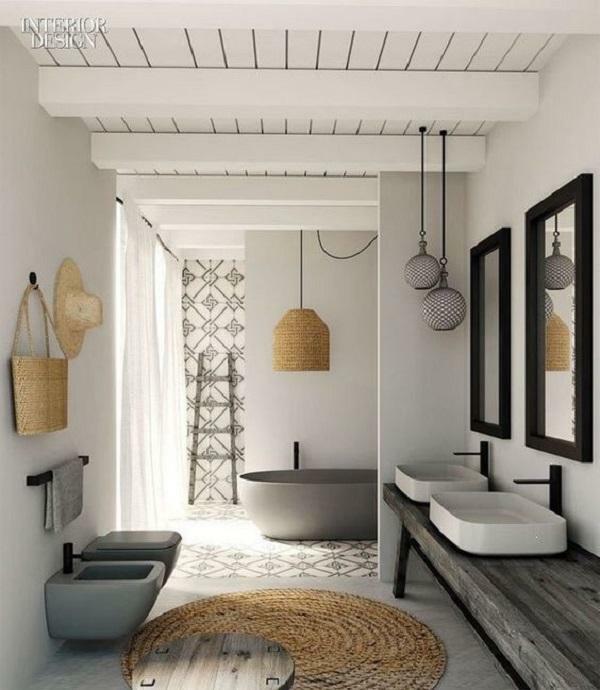 Bald installations, bare walls and untreated wood that look very useful and old are essential in this design. In this design, it is not necessary to hide the age of the building, but with the right details and furnitureto emphasize the age and the ruin of the building. 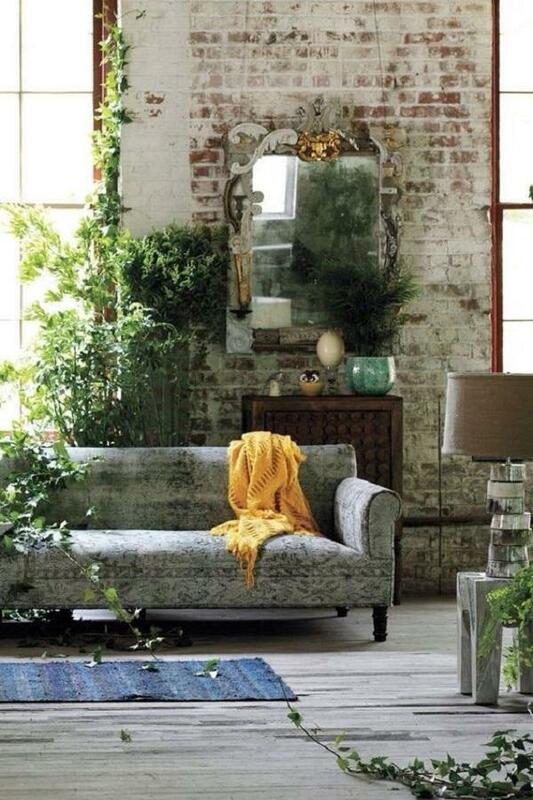 These is very bold arrangement of the wall in the hallway or living room. 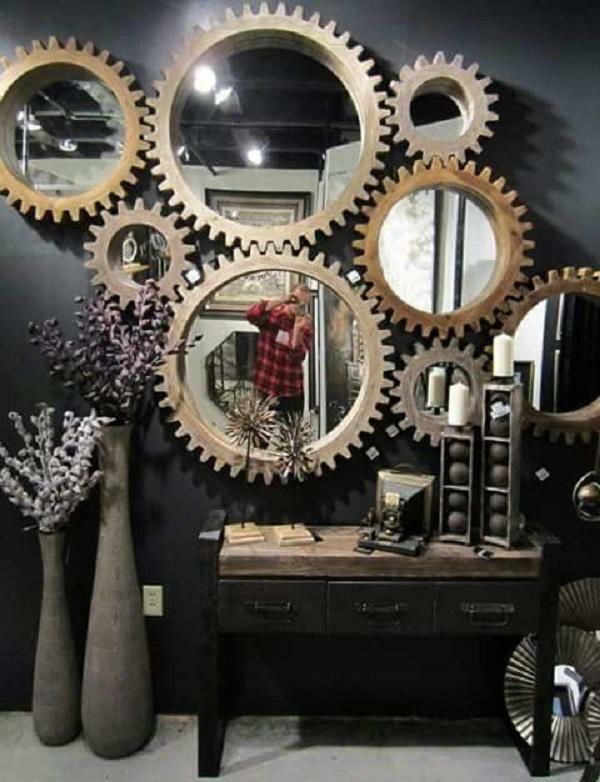 The gears are actually a mirror frame. A wall arranged in this way definitely returns to history. 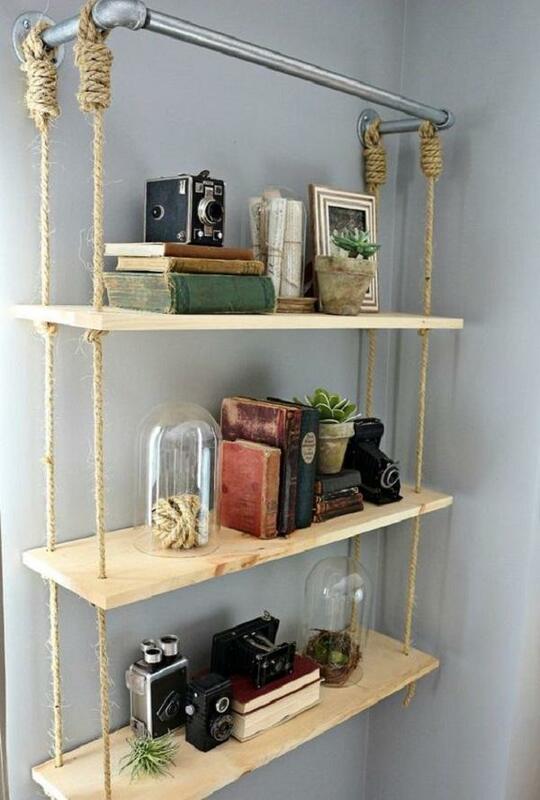 This shelf will surely not leave any of your guests indifferent. Legs of the table and chairs made of iron, as well as the iron chandelier, are very discreetly embedded in this modern space and give it the necessary charm. 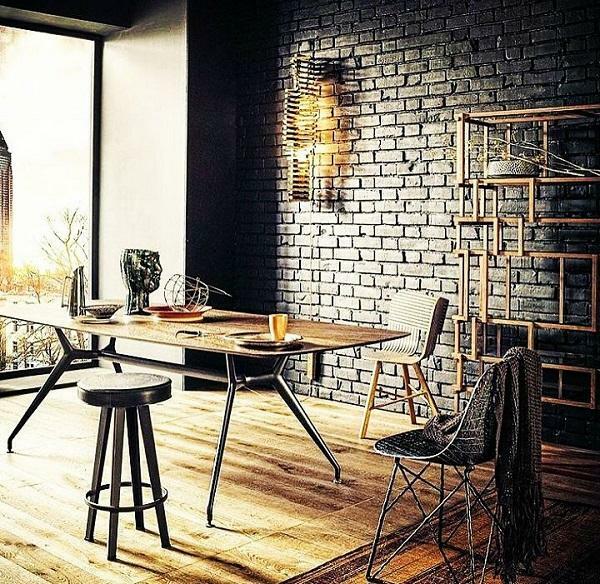 If you want your kitchen to be arranged according to this extravagant style, bare at least one wall to the brick and choose furniture with solid iron parts as this table and chairs. Although this room seems incomplete at first sight, it is actually very smartly arranged and it is even warm. Posters and inscriptions or symbols on the walls may look very interesting. 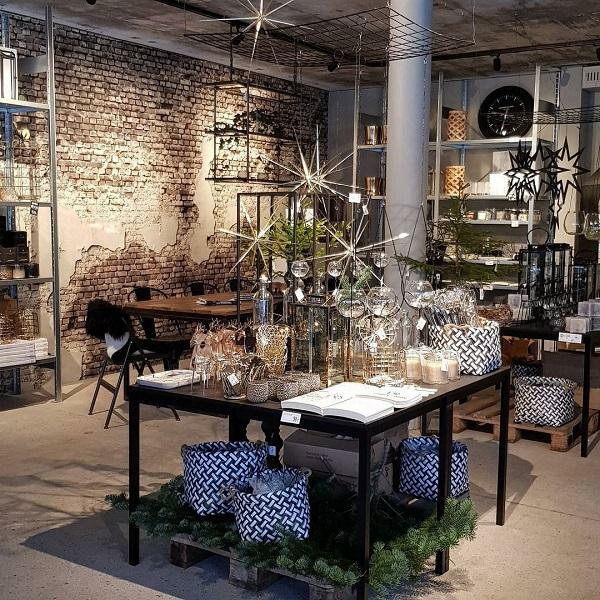 Because of brick, iron and a lot of light in the room, we can say that there are combined Scandinavian and industrial style. 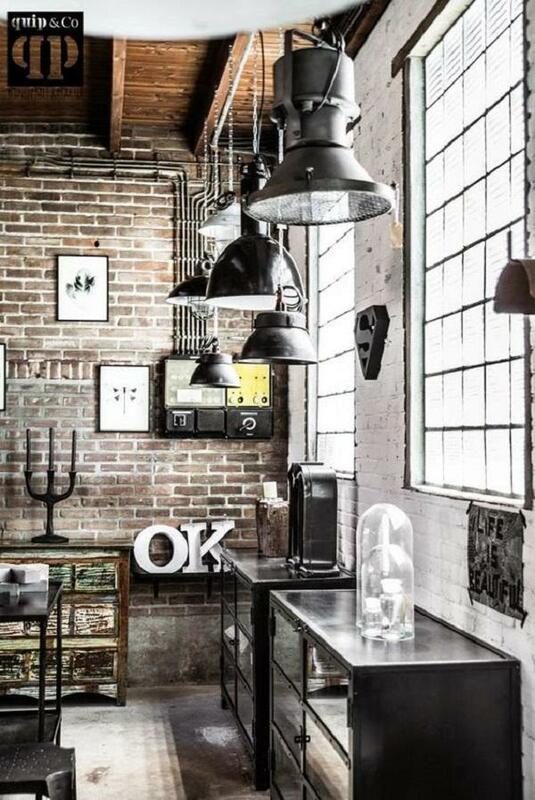 Tall bare walls, lots of iron and little details. 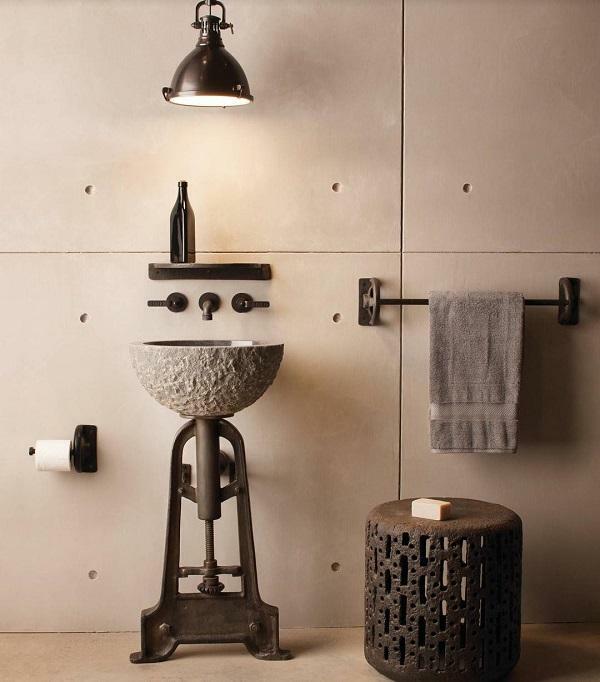 Modern industrial style with minimal details. Because more and more time people spend at work or out of the home, a bit of time is left to fix the house. That is why everything (furniture and ornaments) in modern homes is primarily functional. Instead of wiping dust off thousands of decorations, you better go on massage and relax yourself. 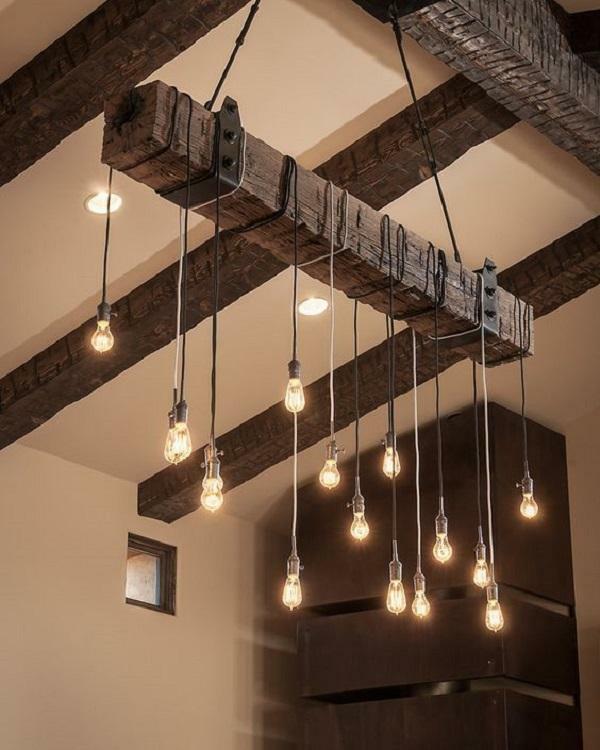 Untreated beams that look very old do not have to be hidden anymore. On the contrary, they are wonderful as they are, and smartly used will be great decoration in your home. Emphasize that beams and its faults! Very nice old lamps that for sure return in the past. Everything in this room is in the spirit of old industrialism starting from these old windows. Old but urban. The bare walls are unavoidable in this interior. If you decide for a leather sofa, do not hide places where it is cracked because of using. This is very desirable in this arrangement. If your room looks a little bit too cold, make it more warmly by adding flowerpots and vases with flowers and green plants. 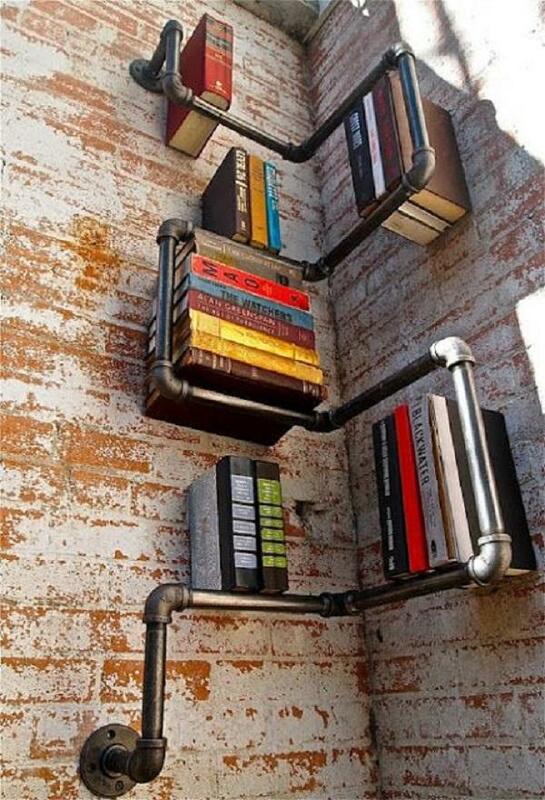 A very creative bookcase in the spirit of the past on which every fan of this design would envy to you. Industrialism also in the toilet. 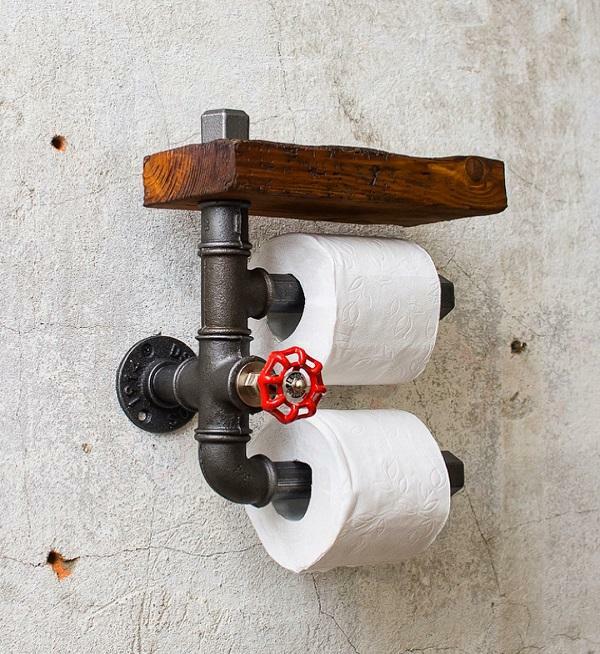 The toilet paper holder is very interestingly done. 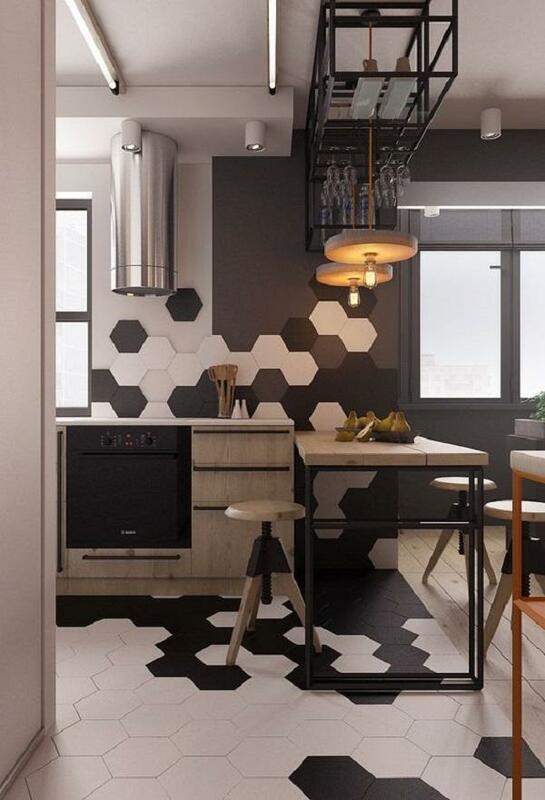 This design allows your walls to be only overshadowed without color. 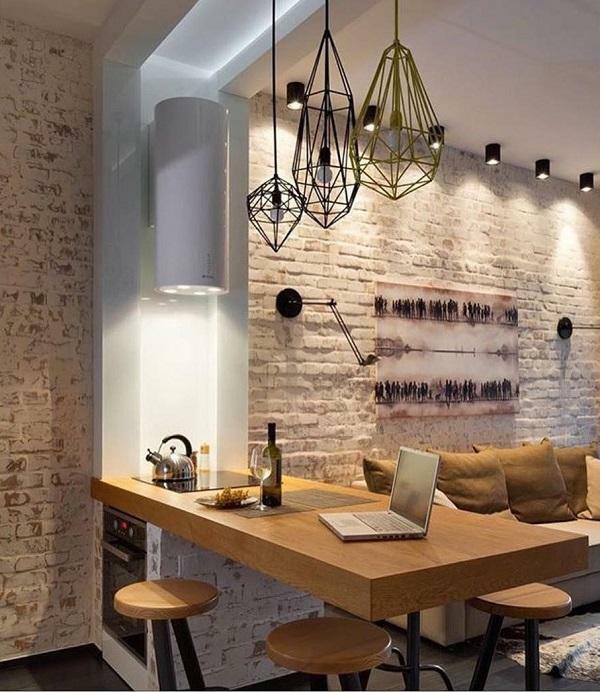 One or two walls in your apartment will give to it a completely different look. Be careful and smart. 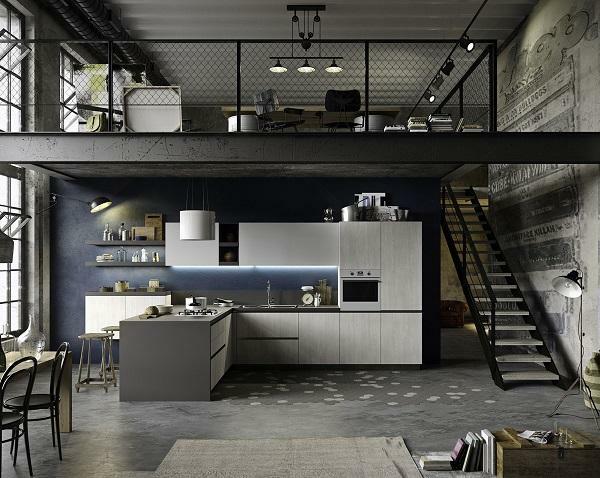 The gray color and black details are one more characteristic of the industrial style. Green plants and knitted baskets are responsible for the warmth of this space. Without them this would be a very cold space full of iron and glass. Here’s an example of how bare installations can fit nicely into space. 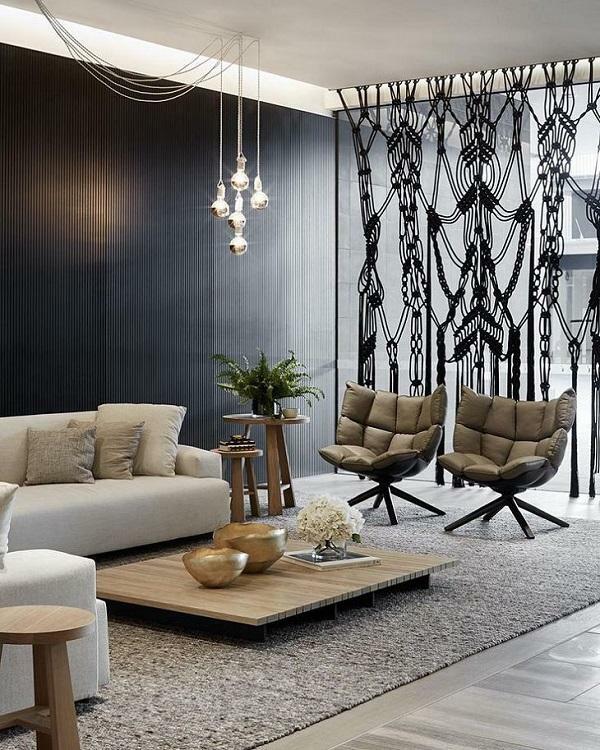 A total contrast to them is this large gorgeous chandelier and furniture made of textile. Only the bravest will choose this kind of lighting above the dining table. What is this – pots or chandeliers ??? A modern, minimalist apartment, with a very cleverly chosen wire fence and inscriptions on the wall. Everything is in the spirit of industrialism.